Heroin Recovery: What Difference Does Christian Treatment Make? 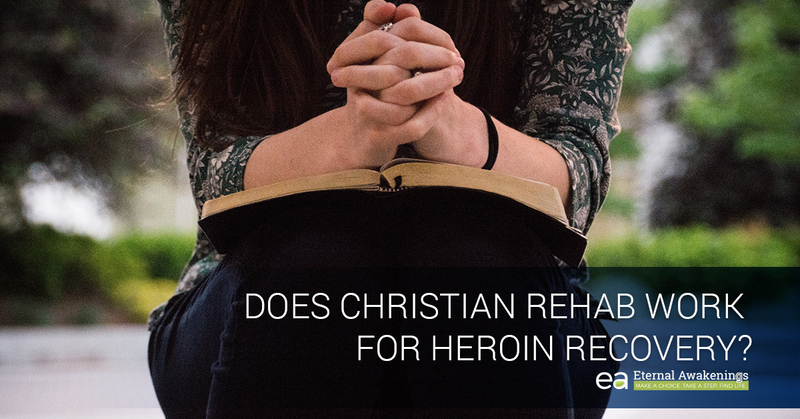 Does Christian Rehab Work for Heroin Recovery? Heroin addiction is no joke, and when you want to leave your addiction behind, you don’t want to bother with treatment that won’t work. Does Christian rehab work? Yes! Here at our Christian drug and alcohol rehab center in Texas, we have worked with many heroin addicts over the years who have succeeded in becoming—and staying—sober. They have discovered genuine recovery, lasting freedom, and abundant life in Christ. So what is it about Christian rehab that works for recovery from heroin or any other addictive substance? In this blog post we’d like to explore a few of the reasons why we think that Christian addiction treatment works. Drugs don’t discriminate. You need a rehab that doesn’t, either. No matter what family background or socioeconomic status you come from, drugs can affect you or someone you love. Drugs don’t discriminate, and sometimes the people who think, “That can never happen to me” are the very ones who experience addiction. When you have a heroin addiction, you need a solution that also doesn’t discriminate. You need a solution that will be effective no matter your background, something that applies to a spectrum of people just as broad as the one that heroin captures. The very reason why people attend rehab is because they come to the realization that they need help from outside themselves in order to escape their addiction. Being in a residential treatment center gives you boundaries that you might not have had the strength to set up yourself. The staff provide counseling and activities that help you to change your thinking. All of this is the human dimension of help from outside yourself. But what happens when you leave the treatment center? If you go back to being on your own to fight against your addiction, you might just fall back into your old patterns. The beauty of Christianity is that it gives you a long-term solution to having help from outside yourself. You have God with you at every moment, and he offers you HIS help. You have someone who is always at your side. He will never leave you, get distracted, or be caught napping. You have access to God’s help, which is better, stronger, and more reliable than human help. Do you know how to depend on God and find that He comes through for you? You can discover that. As a Christian, you get to be part of the body of Christ, a built-in community of people who can continue to support you, encourage you, and lift you up. Heroin addiction is strong, but God is stronger. Being sober is a choice, but becoming sober and staying sober goes much deeper than that. You already know it’s not helpful when your family and friends say to you, “But why don’t you just choose to stop?” In a certain sense, it’s almost as if heroin is choosing for you, overriding all your best intentions, thwarting your every move toward progress, and knocking you back down every time you get back up. This cycle is so frustrating that almost everyone who tries to get off heroin on their own eventually gives up hope that they will ever be able to to do it. It’s not like you can just wake up one morning and say, “I don’t want heroin any more” and go on with your life. You have to pass through a crucible on your way to getting away from it, from the pain and discomfort of detox to the daily choice not to go back to it. And all the while, the heroin voice is screaming in your ears, pleading with you to just go back, just take it one more time, just give in this once. However, there is someone who is stronger than heroin, someone whose voice is sweeter, someone whose power trumps heroin’s power. His name is Jesus. When he forms an integral part of your recovery, suddenly, everything changes. You can rely on him and see heroin’s power broken. Join us at Eternal Awakenings today. We look forward to offering you a serene, safe, stable place for your recovery, where we will introduce you to victorious Christian living as part of your rehab. Contact us today to start the enrollment process. P.S. If you missed our previous article on how Jesus helps with cocaine recovery, the principles there apply just as much to heroin. Check it out!